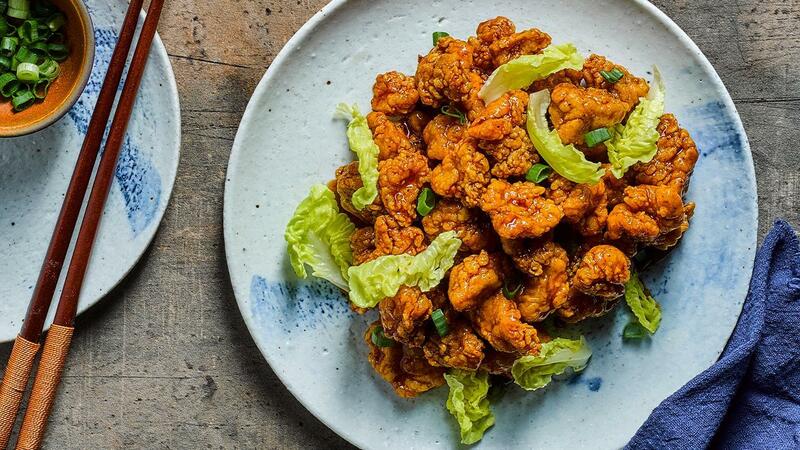 Your marmite chicken fix no longer has to come from your favourite zi char stall. This sweet and thick coating of marmite and rock sugar sauce promises to deliver the same impact and flavour that you’ve come to love in this popular home-style dish. In a mixing bowl, mix well egg and Knorr Hao Chi All-In-One Seasoning. Add in the chicken and marinate. Coat the chicken with rice flour and deep fry the chicken to golden brown. Set aside before dishing out. In a mixing bowl, mix well Knorr Rock Sugar Honey Sauce and marmite. Heat up wok, bring mixture to boil, add in fried chicken. Stir fry and toss the chicken over low heat till chicken is evenly coated. Garnish the plate with butter head lettuce and spring onion.